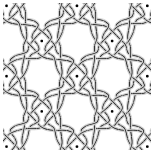 A collection of open source (= free) software and web based tools related to bobbin lace. The InkScape plugins are bundled together in a single installation package. 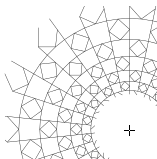 InkScape is a powerful general purpose vector based drawing tool, like these bobbin lace tools it is free of charge and free to change or improve at your own discretion. The screen shot snippets show either pair diagrams or thread diagrams of a rose ground, which differs from a Flanders ground by using four pairs per pin versus two pairs per pin. 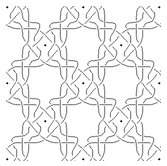 GroundForge is a toolbox to design bobbin lace grounds or braids. Generates thread diagrams out of color coded pair diagrams, supports any stitch. 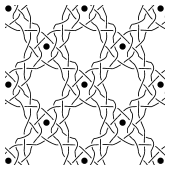 Various collections of predefined patterns or create your own patterns. Ground From Template only pair diagrams. Regular or wrapped around a circle. Only a collection of predefined patterns. The old generators may still have a use case but they are no longer maintained. Limited set of stitches. Fixed set of patterns. Thread diagrams only from a table of stitches. Fast. The InkScape plug-in can change thread styles. Only about a dozen traditional grounds and braids. An export of stitch by stitch images can be imported by third party tools to create an animated image. Flanders only. No Pair diagrams. Works even with old browsers. More patterns than the plugin and it scales better. You can design your own patterns, though the definitions might be a bit cryptic. Allows matching nested grids. Less patterns than the web-based version but you can add your own marks for one pie and have it automagically repeated to a complete circle. The built-in grid feature of InkScape only provides snapping points. This plugin generates printable dots with configurable size, distance and angle.